Obviously with the name This Creative, we do quite a bit of creative projects. Our skilled graphic design team has worked with a variety of design requests, and completes everything from scratch. 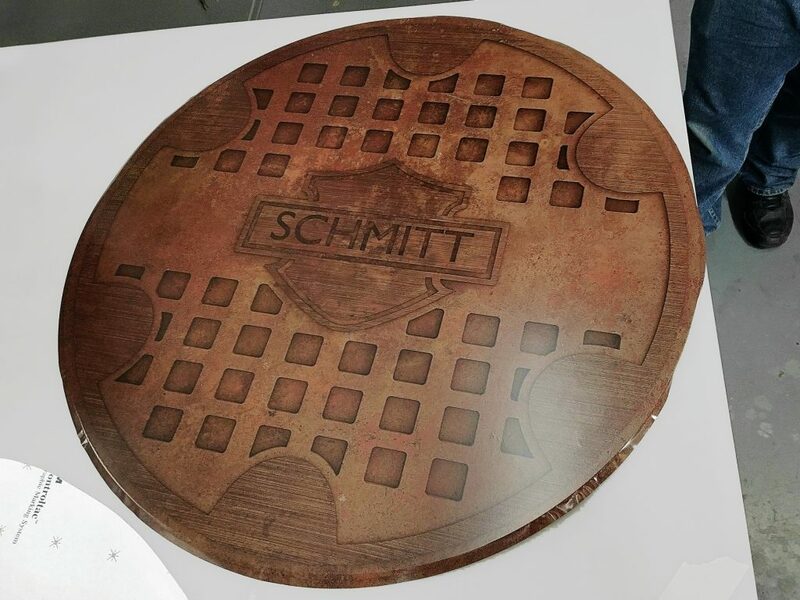 Recently, This Creative’s graphic design team was tasked with creating a custom manhole cover for a client’s mancave. Now, without CNC machines or routers (not that kind, anyway), the process of designing a realistic appearing manhole cover needed to be approached from a unique perspective. The client provided reference photos, and This Creative’s team got to work. A lot of people don’t realize the depth of process that goes into a true custom graphic design job. Using those client provided images, the design process began Adobe Illustrator. Through careful and tedious process, we crafted a vector image of the basic cover. That vector image was then imported into 3D modeling software where it was extruded and textured. It was close to perfect, but the final touches remained. The unfinished design was brought into Photoshop, where it was color tested and corrected. The final pre-press preparations were completed, and the digital piece made its way to tangibility. The Manhole graphic design was printed onto a vinyl wrap material. To create the authentic feel, the initial print was followed with a matte laminate. That completed piece was then applied to a round steel plate. The edges were trimmed, and the final product was ready to go. Watch the awesome full graphic design process below in this speed design video! Ready to get your design This Creative? Contact our team today at 239-437-1010 or get a quote online now.